Living with less creates more space, freedom and peace of mind. I was a bit skeptical at first, but after a few months without a traditional sofa, bed or dining set, I am living more easily and comfortably than I ever have. We own 4 major pieces of furniture: our bed, a floor lounger, this console desk, and a low dining table we built with prefab pieces from Lowe’s. 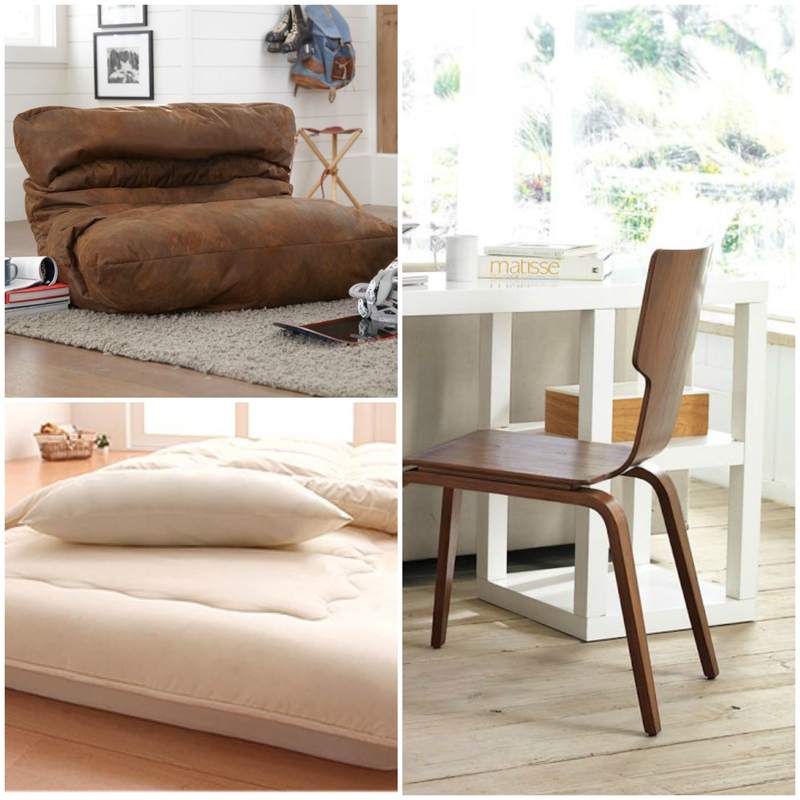 Add in a few floor pillows and our trusty exercise ball and we have everything we need. * Without heavy furniture, it’s a breeze to clean. All our pieces are light and portable, making them easy for one person to lift and vacuum. * Everything is mobile. We can sit by the fireplace or lounge by the record player. We just pick up the pieces and put them where we want. * More breathing room. I can do yoga in the center of our living room. My boyfriend can do his fancy yo-yo-tricks without breaking anything. We even have space for impromptu dance parties. * Health benefits. Sitting on the floor is great for the body. Muscles are engaged; hips and legs get a nice stretch; not to mention the constant workout of getting up and down. No wonder the Japanese are in such great shape! * More money in my pocket. Whole paychecks that might have gone to dining chairs and a bed frame, can now happily be spent on lemon drop martinis and a new hybrid bike. The greatest benefit of this minimalist approach is the peace of mind that comes with it. I no longer feel overwhelmed by my things and finally feel like I have room to breathe. How do you create space in your home? Mercury retrograde…hmm, that explains a lot. I’ve been all about out with the old, in with the new lately. You made a great connection – it is about our relationship to money, our definitions of “need” and “happiness.” As any therapist would tell us, there is always some deeper belief underlying our habits, and we need to redefine them in order to make any lasting change. The move helped kick me into gear, but the tough part is to keep it up. I’ve been trying to do the one in, one out rule. One thing that has worked for me with those hard-to-part-with items is storing them away for a few weeks or a month….as time passes, you realize you need it or don’t and it’s much easier to give away. Books are hard too, but once I got a library card I realized I still have (free) access if I ever really need them. Good luck and let me know how it goes! I donated two garbage bags worth of stuff (!) a few weeks ago! My closet has some space now, but I can still make a bigger dent. I’ll keep chiseling away…though I’ll be honest, with the summer coming, some new stuff has started to fill in the space. Oops. I’m starting to be a better gatekeeper of what I let in though (basics that go with more, and that fit well). Good point about the library part, and the scrapbooking stuff. 😉 Summer cleaning here I come! Hooray for you! And yes, I know what you mean about spring/summer shopping. It’s when all the best stuff hits the stores. I’ve been trying to stick with the “one in, one out rule” with lukewarm success.